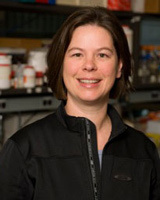 The Brain Repair Group at SRI, led by Dr. Isabelle Aubert, focuses on developing therapies to stop neurodegeneration and promote regeneration under pathological conditions such as Alzheimer’s disease and stroke. Noninvasive delivery of therapeutic molecules including anti-amyloid agents, genes and stem cells to the brain. Promoting adult neurogenesis, neuronal survival, and axonal growth in the hippocampal formation. Increasing acetylcholine production and release in brain areas related to learning and memory.